Terry Pack… Paul Kendrick & Terry Pack. It was a pop harmony band: a guitar, bass, keys and drums quartet with three voices, doing 50s, 60s and 70s material. I enjoyed it. The drummer you can just make out was Paul ‘Bunny’ Freeman. Out of shot is Tony Bird. Mick O’Dowd… Am thinking maybe National Hero or Easy Street? Terry Pack… That’s right. National Hero. 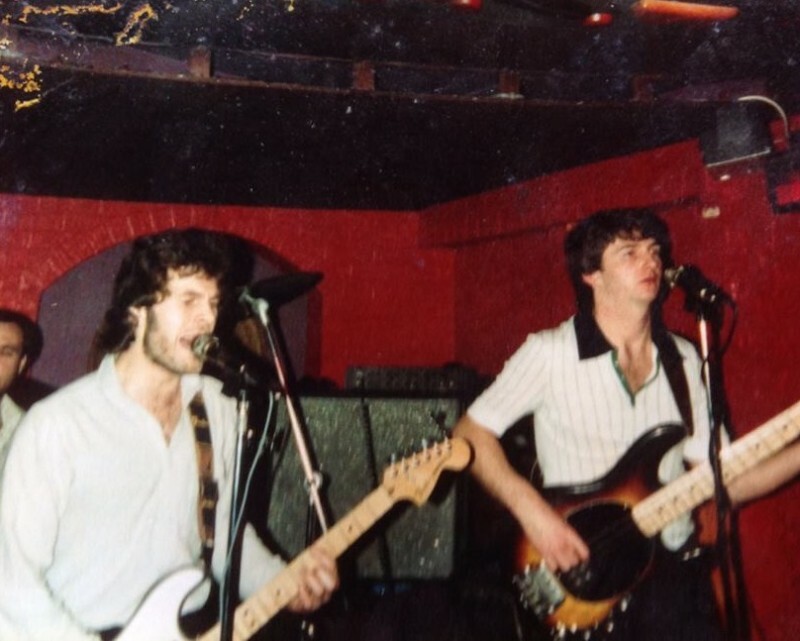 We played night clubs, holiday camps, British Legions and Working Men’s’ Clubs, in the days when there were lots of those gigs, and well paid. Mick O’Dowd… Thought it might be them as I promoted them at The Carlisle around this time Terry. 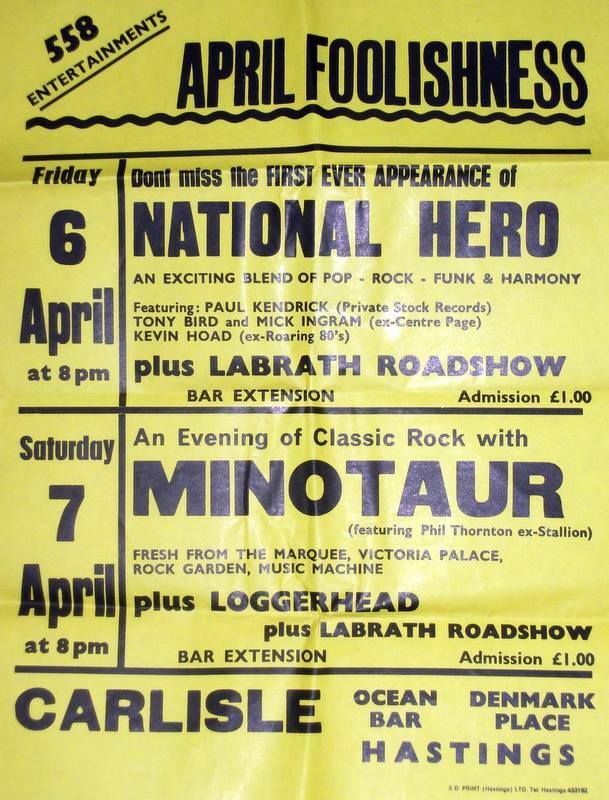 Phil Thornton… I have no memory of playing at the Carlisle with Minotaur !!! – did this happen ? was anybody there ? Mick O’Dowd… Yes it did happen as I put it on. Not full but I made a modest profit on the night Phil. David Miller… I was there, your Mum and Kaye were there, John Wilde even showed up…. David McKnight, Marc Reynolds and Glen too. Upstairs, wunnit…! 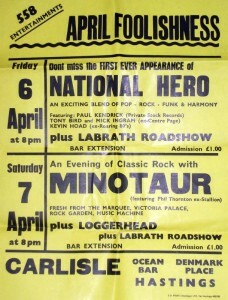 I remember that night (April 7th) as a member of Minotaur, I lost my voice but met John Wilde for the first time. One scene was coming to an end and a new one was bubbling up and getting ready to manifest. Mick O’Dowd… Any idea where Steve & His Brother are now Tim? Tim Moose Bruce… I never knew them . I just saw the band that night upstairs in the carlisle. Think the main band that night was Footlose or Slack Alice as they were latterly known when they changed the band name. Harry Randall may remember that night. Mick O’Dowd… I used Labrath regularly as Steve was very reliable. I would love to know what became of him.